Our family and children clientele are often navigating their lives without certain everyday items that allow for a better quality of life. Throughout the year, CFCS receives a variety of requests from clients, covering a wide range of needs. Among the most requested items are clothing, furniture, groceries, help with purchasing back-to-school supplies, tickets to cultural or sporting events, and a range of household items. Whenever possible, we try to provide clients with new items, however, we are always willing to accept gently used furniture, luggage, and other household amenities. Please note we cannot accept donations of used clothing. We do not have an all-hours drop-off center for these kinds of items, so please email donate@helpfamilies.org to make arrangements. Click here to purchase items on the CFCS Amazon Wish List. When making your own purchases on Amazon, the Amazon Smile program donates a percentage of your order to the organization of your choice. 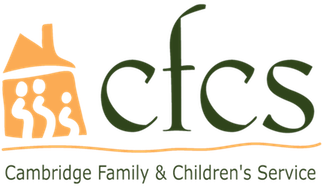 Click the icon below, sign in to your account, and enter "Cambridge Family and Children's Service" in the search box. Once you've selected CFCS as the beneficiary, go about your shopping as usual! *Please note that when you buy items through Amazon Smile, the percentage of your purchase comes to CFCS anonymously, as Amazon does not disclose information about the individual purchasers. Please email us at donate@helpfamilies.org to receive a formal acknowledgment for your records. Thank you for selecting CFCS as the beneficiary of your Amazon Smile purchase! GIFT CARDS: *Gift cards to clothing, home and grocery stores are an easy and welcome way to help.